ShearComfort's Universal Pet Seat Covers by 3 Dog Pet Supply are a great way to protect your back seat from your dogs. When your dog travels with you, this durable material will shield your rear seat from dirt, sand, and other dog debris. Maximum protection from your dog's hair, drool, and claws too. 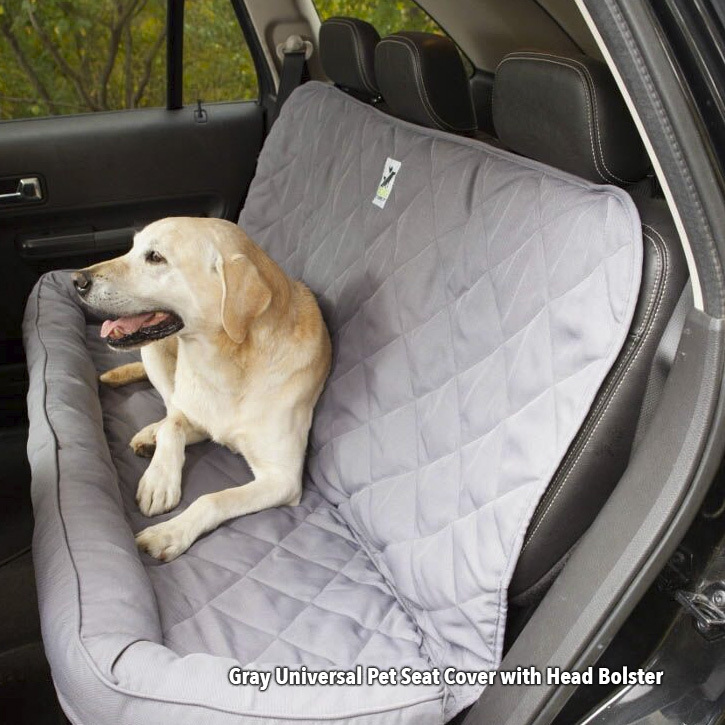 In addition to this universal product being very protective, the non-slip material makes the drive more comfortable and relaxing for your four-legged passenger. We recommend upgrading to the Universal Pet Seat Cover with Head Bolster for Dogs. You will enhance your pet's overall comfort in the car by providing them with a special spot to rest their head. Your dog will thank you! Universal Pet Seat Covers are a great addition for anyone who has already purchased Custom Seat Covers. The extra layer of protection will keep you from removing and cleaning your seat covers. As a dog owner, you know all the possible messes that come with your canine friend. If your dog travels with you in your vehicle, they can bring a lot of that mess with them. This can make your vehicle dirty, smelly, and look very unappealing. It can also cause unnecessary wear and tear to the upholstery. If you're seeking a cost-effective solution to keep your back seat clean and protected, these universal pet seat covers are the right fit for you and your pets. Seat Back (where you lean): 54" x 26"
Seat Cushion (where you sit): 54" x 19"
When you order from us, we want you to be happy with the product you receive. If you have questions or concerns about your universal pet seat covers, please contact us today. We guarantee both the quality and workmanship of our products. We will happily replace any pieces that show manufacturing defects -- free of charge -- within one year of purchasing the product. This warranty covers broken buckles, straps unweaving, unusual wear to the material. You will not be charged shipping for warranty claims. This item is returnable; within 30 days of purchase, in new resalable condition (10% restocking fee + return shipping will apply).